Home / Vitamins & Supplements / Retail-grade Brands / Natur-Tyme / B-Healthy! 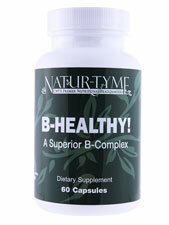 Product Description: Natur-Tyme's Enhanced B-Healthy! is a complex formula enhanced with superior, unique, and highly bio-available forms of Coenzymated B vitamins and methylated Folate for maximum absorption and utilizzation. Warnings: If you have a serious medical condition, consult a healthcare professional before using this or any dietary supplement. Keep all nutritional supplements out of the reach of children. Additional Info: Made in USA. Does Not Contain: Lubricants, Fillers, Flowing Agents, Preservatives, Excipients, Starch, Sugar, Salt, Gluten, Corn, Soy, Milk, Egg, Fish, Shellfish, Tree Nuts and Peanuts., Contains no additives of any kind. Suggested Use: Adults take two (2) capsulesin the morning or afternoon with or without food or as directed by your healthcare professional.